Germany has the reputation of being a boring and work driven country. Quite the contrary it provides everything required for a healthy work-life-balance. With only 40 hour work weeks, great wages and a huge amount of free time activities one could not ask for much more. For this and many other reasons Germany ranks in the top 10 in life-quality worldwide so don’t worry about your social life in Germany. Therefore let us have a closer look at what Germany has to offer! Germany happens to be not only the industrial but also the cultural hub of Europe. It is not far-fetched that these two facts are actually linked. Many people come here seeking a better future and we do everything to make that possible. You will quickly learn that all our rules and laws are actually to your advantage. Once settled you will not want to leave again just like all the other people trying their luck with the new and advanced version of The American Dream which is “The German Dream”. Join others in their endeavour of establishing themselves in Germany and help each other out. You are not alone! Self evidently you can also find a helping hand or useful advice in any “real” German, even in English if necessary. You might just have trouble finding one in this multicultural melting pot. 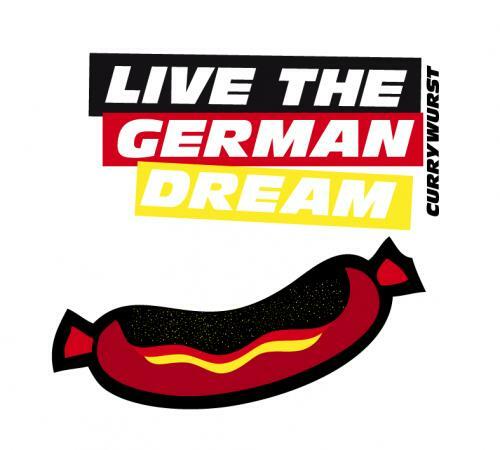 As the “Currywurst” in the above picture already suggests food is something that has to be mentioned when talking about living “The German Dream”. Of course you think of savory dishes including meat an d potatos accompanied by a cold beer when it comes to Germany. In reality you will find out that there is a vast variety of cusines represented in Germany. You might be happy to hear that there are plenty options to get vegetarian or even Indian food anywhere just like Italian, Turkish, Vietnamese, Chinese, Spanish and American just to name a few. Especially in cafeterias, it is being ensured that there is a different vegetarian option every day. But let me tell you what I like best when it comes to food in Germany. It is the supermarkets! Nowhere else will you find such a display of high quality low-cost products. Name it, we have it: French cheese, Italian ice-cream, English Tea, Spanish ham, Norwegian salmon, Swiss chocolate and the very own German bread and beer. Just listing an excerpt of the most famous examples. Sports & Fun – Be active! Time to convert all that great food we just talked about. Germany is the country of sports clubs and group activities. People enjoy an active lifestyle as riding the bicycle to work and pretty much everywhere else is one of our favourite things to do since it is fast, cheap and environmental. So better start practising and saddle up as this is going to be your new mode of commute next to public transportation. If you are looking for something more leisure go have a barbecue at the park located right in the city centre, throwing a frisbee while the food is slowly being roasted. Do not forget to check online for public concerts, outdoor parties, public viewings and other activities on a summer weekend. And if its getting cold definitely goes check-out the cosy and entertaining winter markets. The big cities of Germany like Berlin, Munich, Hamburg and Cologne are always worth a visit and can be astoninglishy different from each other when it comes to people and customs. All of these characteristics can be found throughout the biggest and busiest cities in Germany. So if you feel like big cities the way you know they are too stressful for you maybe give these ones a try. Apart from the functionality and comfort German cities offer there is also lots of modern and pop-culture influence to be found. The population of especially big cities takes a lot of proud in expressing themselves. Therefore graffiti, dance and other street art area are constantly present, inviting to stop and gaze or even engage. I am confident by now you got a good idea of which advantages “The German Dream” brings with it. Enough of the praises, go and and find out for yourself. Make a dream come true with Educaro!